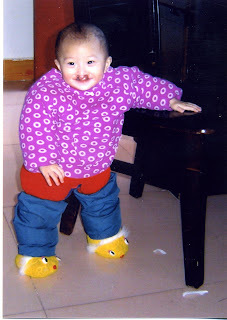 We are thrilled beyond belief to introduce to you our beautiful little girl waiting for us in Xinyang, Henan, China. I received the call at work on Monday, Feb. 23, Sarah from our agency said, "I have a beautiful little girl who needs a mommy and daddy, I was wondering if you and Scott might be her mommy and daddy." Thru the tears I said we might be and asked for more information. 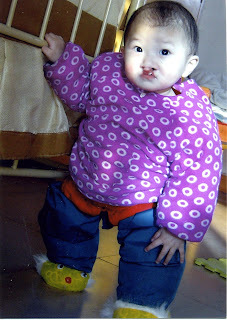 She told me Luo Min Li was 1 on Feb. 12th and has an unrepaired bilateral cleft lip and unrepaired cleft palate. She loves to look at her reflection in the mirror and also loves to go outside. She is beautiful, perfect and OURS!!!!! We sent all her infomation to our pediatrician and in a few hours he called us back and said what we already knew, she's beautiful, perfect and OURS!!! We sent in our LOI (Letter of Intent) on Feb. 25th and today we received our pre-approval from the CCAA to adopt our daughter, Laila JeanneLi Van Gieson. We hope to travel in May and will get her repaired here. Enjoy the pictures and please feel free to leave a comment, we will be turning this blog into a book for Laila and would love for her to see all of your messages. And our favorite picture. She has a beautiful smile and such life in her eyes!!!! We are so very, very EXCITED for you all! Hugs the size of Texas from us here in New York! I am so very happy for you!!! Congrats! She's absolutely beautiful! I hope May comes fast for you. So very happy for you both. Now May can't come fast enough, huh? Please keep us all updated. I can say one thing: you will love being a mommy and daddy. I know I do-the daddy part. Congrats she is beautiful, look at those eyes!! We are dancing to Mama Mia in China for you! CONGRATULATIONS!! We are so excited for you and can't wait to meet the newest member of our family in July! Safe travels to you both and keep us posted on your beautiful baby girl! What a sweet little pumpkin! Congratulations ahd here's to speedy travel. She's gorgeous! A big congratulations on that new little girl who will be joining your family soon! Take a TON of pictures! I promise you will miss her wide smile when it's gone (and I speak from experience here). She is beautiful! I am so happy for you and can't wait to follow your journey to your precious baby girl! she is a DOLL!!!! love her smile, congratulations you guys!!! So very happy for you!!! I love her eyes... how can you not fall in love with such a sweetie!!! Congrats... hope the rest of the "A"s come quickly!!!! Congratulations!!! Your baby girl is absolutely beautiful!! I love that smile in the last pic! The end is finally in sight!!!!! This is so beyond amazing! I am so happy for you both! I can't wait to meet her! Joanna, I am beyond happy, thrilled, excited for you. She is totally cute, love the smile and those adorable eyes. And so young!! Hugs to you my not-so-secret pal anymore! You're right she is ADORABLE. Thank you for sharing! Here is to a short wait to travel. 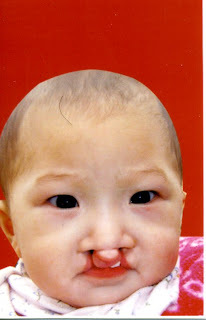 Congratulations on the referral of your BEAUTIFUL baby girl. We are so happy for you and can't wait until you get to travel. You are blessed! Laila, you are beautiful little girl and your mommy and daddy are truly blessed by you. I can not wait to follow your journey home! OH, MY, GOSH!!! She is absolutely BEAUTIFUL! Whooo-hooo!!! Come on LOA and TA!!! Best wishes on your journey... she looks like she is dressed for a snowstorm!! Can't wait to see the pictures when she is in the USA! Joanna, she is just beautiful. What a true blessing! She is truly beautiful. I can't wait till my niece is finally here. I'm really not good at waiting.